A Funded Delivery Period encompasses a 12-month period that begins when the contractor delivers the first item of a fiscal year procurement. Confusion exists regarding this time period because, in many instances, accurate Administrative Lead-time (ALT) and Production Lead-times (PLT) have not been included in the calculation. The calculation should begin with October 1. From this point in time, the ALT and PLT should be added. This amount of time plus the next 12 months are included in the funded delivery period. When excessive lead-times are included in the calculation, additional quantities are procured that could have been funded in the following fiscal year with no change in the delivery schedule. This is the amount of time required to complete the administrative actions leading to contract award. In most cases, ALT actions do not require funding and can therefore be accomplished prior to October 1, at which time the next fiscal year’s funding is appropriated. The ALT is used to forecast contract awards. Longer lead-times require that a larger quantity be purchased to support yearly requirements. Lead-times should therefore reflect an accurate assessment of the time required to process the administrative actions. This is the amount of time required by a contractor to produce the first item after contract award until deliveries begin. 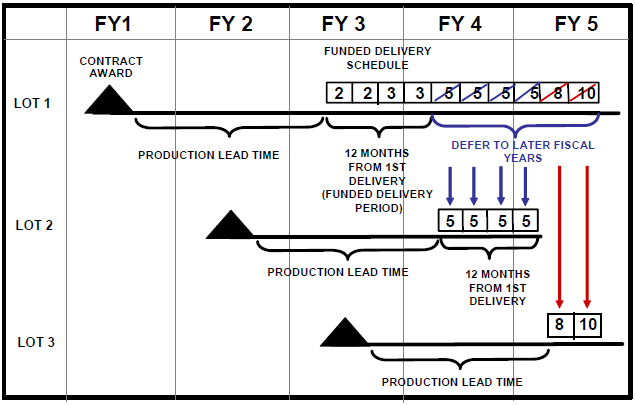 Procurement Lead-time is the total of ALT and PLT. When used to determine quantity requirements, calculations should begin when the first ALT action begins.